A MAN who was wanted in two states for various offences has been arrested and charged in Coffs Harbour after leading police on a high speed chase. According to Highway Patrol supervisor Sergeant Jarrod Langan, the man was the subject of three police pursuits, and failed to pay for fuel a total of four times in the past week. 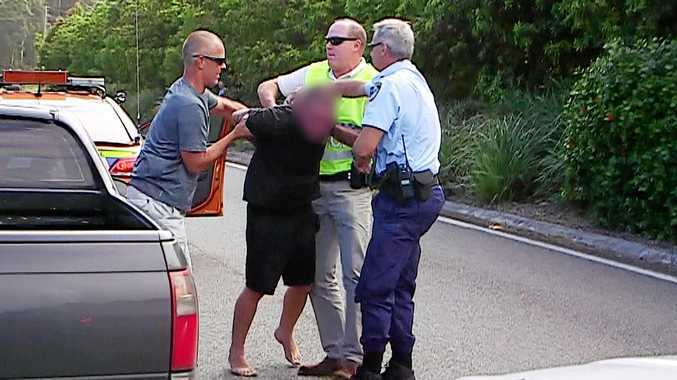 The man, driving a Back Holden Commodore ute with QLD number plates, was detected speeding at Glenugie on Thursday afternoon and led police on a pursuit for 50km, reaching speeds as high as 170km/h. The ute was believed to have been stopped after Highway Patrol cars surrounded the ute on the Pacific Hwy at Coffs Harbour. The car was then searched and seized and the man was taken to Coffs Harbour Police Station. The man faced Coffs Harbour Local Court this morning where he was charged with a number of offences and refused bail. Meanwhile just after 3.30pm on Thursday another pursuit was initiated through the streets of Coffs Harbour for a car believed to be a white Holden Commodore. The pursuit took place through Murdoch, Francis and Beryl Streets. The driver failed to stop for RBT and the car was later located in Oriana St. The male driver was arrested, charged and granted conditional bail.